"Impeccable. Service was warm and generous, room was gorgeous, location was perfect for everything. Absolutely loved it. Best hotel experience ever." "Good hotel and location, friendly staff"
"wonderful, the staff are lovely, the hotel has a lovely warm feeling, great energy, will definitely return." "We had a wonderful time and returning at the end of the day to a wonderful hotel made our experience even better!" "Excellent! We will definitely recommend your hotel to friends. And if we ever visit Florence again, we will stay with you and ask for room 26! Thank you so much for making our trip to Florence so nice." "Honestly couldn't have been a better location for our short visit. We could easily walk the sights, catch a train, and most importantly, Andrea and staff were always willing to help with directions, information and outings-anything! Really outstanding. A million thanks!" "We loved it!! We felt like it was our home away from home!" "We had a lovely time in Florence and finding a good hotel is one less worry. The hotel was very good and we would recommend you and book again - next time we would go for a river view room! You could promote yourselves more on web sites as your location is great and really only ten minutes or so from train station on foot which is good too. Thank you." "Our recently renovated room with two bathroom areas was a perfect place to relax and recharge in Florence. Staff has expert knowledge about all things to see and do. Service was excellent." "Great location and nice room for a 2 adults and 2 children. Despite being right by the main tourist areas, it was a quiet room. Staff were wonderful. 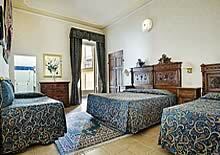 Lot's of hotel rooms in florence, the people working at this one make it the place to choose. Felt like we were staying with friends." "The place was perfect to walk to the museum and walk to the cathedrals. the personal was very helpful." "The staff was exceptionally friendly and helpful. The location is ideal- close to everything but away from the crowds of tourists. The hotel has an old world charm and is super clean and well run." "From the moment we arrived we were treated better than family. We want to thank you all!" 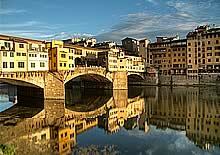 "Good location to see sites, few blocks from Ponte Vecchio bridge. There are a lot of good restaurants on the other side of the bridge so location is also good walking distance for this and Pitti Palace. Also an easy walk to Uffizi and Duomo group. Staff was extremely enthusiastic, very helpful with directions and suggestions. Room was fine. Bathroom was recently updated. Like many older hotels, the room and bathroom would greatly benefit from some shelves and additional hooks. I appreciated that they had an insecticide available in each room since there are bugs especially if you have the windows open at all. Since the air conditioner did not work in our room, having the window open for at least some time to cool down the room was necessary. 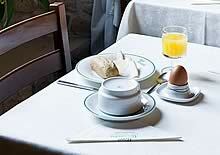 Breakfast was very good, good variety of eggs, meat, cheese, cereal and the pastries were fresh and delicious. If you are not that mobile, then keep in mind that you will need to climb a flight of stairs to get to the elevator and likely more stairs to your room unless you are on the same floor as reception. 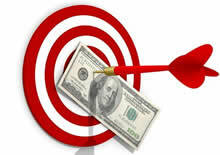 Overall, it was a good room for the price especially considering the location." "La calidad y calidez del personal ayudan mucho a la hora de puntuar..."
"The Hotel Alessandra's location, comfort and hospitality made our trip to Florence even more special. We felt lucky to be so close to the historic center yet in such a quiet location -- and our room had a view of the Arno too. My wife, 2 teenage kids and I look forward to returning soon." "This is the perfect spot for an easy and comfortable stay while being right next to everything you want to see in the old city. The staff was very friendly and helpful. Overall a great experience, it was exactly what we were looking for." "It's a very lovely place to stay and the staff are very friendly and helpful. Only downside is carrying luggage up a flight of stairs to where the lift starts. Easy though for the young and fit. Breakfast was exceptional. Situated in old quaint street, very quiet and close to everything. Highly recommended." "We truly enjoyed our stay at the Hotel Alessandra. My husband and son had stayed there before and really liked it. My daughter and I liked it as well. Thanks." "We had a wonderful stay at the Alessandra and would definitely stay again. Thanks for making our stay so great."